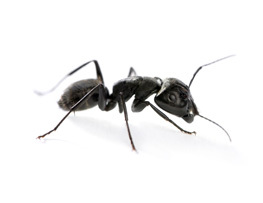 Ant pest control services in Staines, Weybridge, Twickenham, Shepperton, Richmond. The ant which gives rise to most annoyance in the average domestic dwelling is the Black Ant or Common Garden Ant. As its name implies, this is a black ant although more accurately it is of a blackish-brown colour. It varies in size from 3 to 5mm (1/10th to 2/10ths”). The Common Black Ant lives out of doors where it can be found nesting in cracks in lawns, around and under stones, at the roots of many plants on which black and green fly are feeding, between bricks in walls, in crazy paving and many other places. Around buildings, the nest opening many be distinguished by small piles of fine earth brought up from under the flagstones etc. Individuals are responsible for specialised duties within the community. There are: workers (sterile females); fertile males; and queens (fertile females). The worker ants build and extend the nest, look after the larvae forms and forage for food, whereby they become pests. The queens do none of these duties, but remain almost exclusively within the nest. Mat-ing amongst sexual individuals takes place on the wing. These spectacular swarms involve large numbers of ants and take place between mid-July and mid-September. The actual swarms only persist for 2-3 hours. The eggs are laid in late spring and the white legless larvae hatch 3-4 weeks later. The larvae are fed on secretions from the queen’s salivary glands until fully grown, when they will pupate, forming the well known “ant eggs”. From these pupae emerge the first brood of worker ants. These tend subsequent broods. The sexual forms are not produced until late summer. The entire cycle takes about 2 months to complete. Under favourable conditions a nest may persist for several years.